Instant Payment is a service that allows Freedom! to pay you before anyone else, even before AdSense! More information in the video below. Are there any requirements to use Instant Payment? The minimum instant payment request is $100, if you have chosen Tipalti or Payoneer as your payment method, and $25 if you use PayPal. Yes. Associated to each transaction request, there is a 10% fee. How is this different from Advance Payment? With Instant Payment, partners can request payment from their estimated earnings, so they will not need to wait until Advance Payment is ready to be sent. Can partners claim all their estimated earnings with Instant Payment? No. You can claim up to 50% of your estimated earnings. 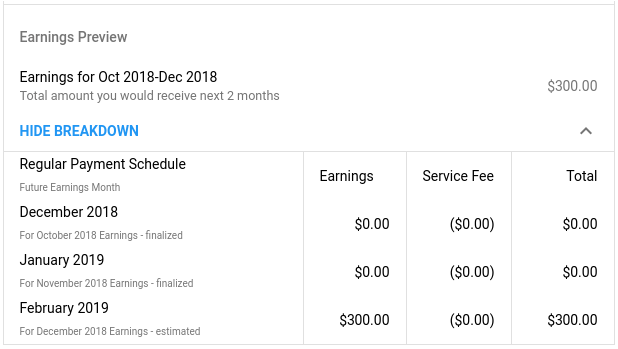 The rest of the earnings will be paid according to the payment option you have selected, following the associated payment schedule (normal payment or Advance Payment). Why can I claim only 50% rather than 100% of my estimated earnings? This is to mitigate the risk of finalized earnings being materially less than estimated earnings. Below is a detailed comparison to clarify how everything works. When you are in the process of requesting an Instant Payment, you will be able to see a breakdown of the earnings, depending on the various scenarios. Let’s see some examples. We will consider that in this example, the total available amount to be claimed is $27.26. Breakdown view if you are not using Advance Payment. Total claimable amount available ($27.26) is requested. After claiming the $27.26, note that the 10% fee is applied, and the total amount to be sent is $24.53. 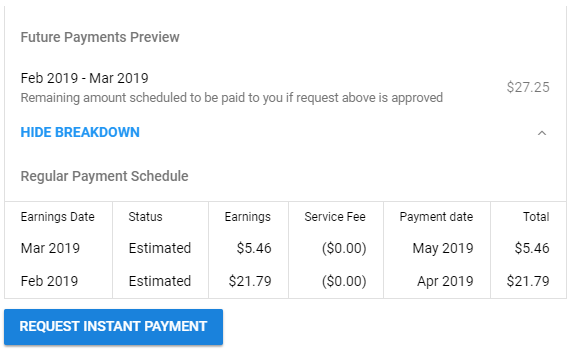 In this scenario, since the partner is requesting the total claimable amount of $27.26, these will include both the claimable amounts of February and March estimated earnings (50%). This means that when a partner requests an Instant Payment, the amount will first be taken from the estimated earnings (up to 50%), and if not enough for the amount the partner wants to claim, the remaining earnings will be taken from the finalized earnings of previous months (if available). 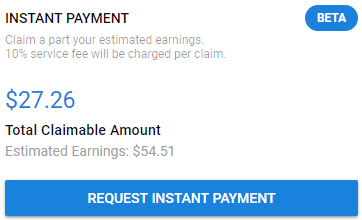 How can I request an Instant Payment? Login to your Freedom! Partner dashboard at https://www.freedom.tm. 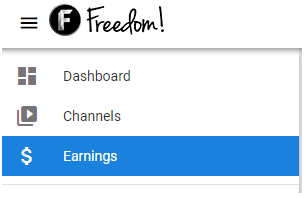 Click the "Earnings" page on the left. 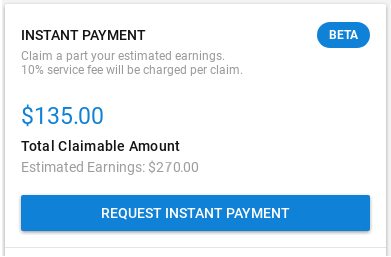 On the top right corner of the page, check if there are any earnings available for Instant Payment. Select the source of the earnings and click the “Next” button. You can see the available amount that can be claimed from each of them. Note: You will skip this step if you only have 1 source or earnings. 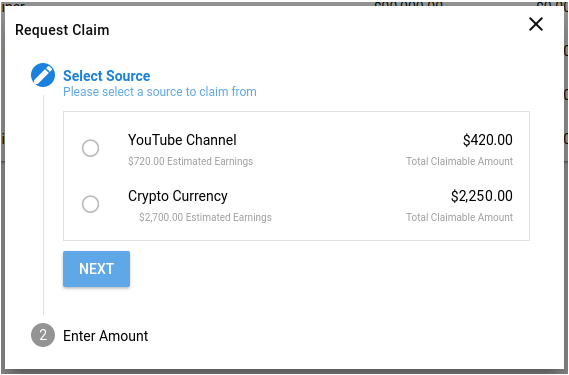 Select the amount you want to claim from the source you selected. Depending on the amount you select, you will also see a preview of the amount you will receive in following payments. You can see more details if you click “Show Breakdown” as seen in the image above. 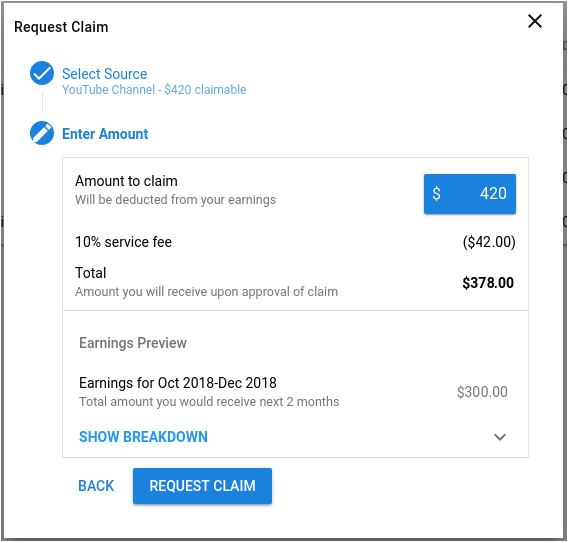 In the image below, you can see what you happen if you had chosen to claim the full amount available for payment, as seen in the example above. If you try to claim more than the amount available, you will see the message. If the amount you selected is available in the claimable amount, you will receive a confirmation notification. Once I request an Instant payment, when will the payment be sent? Payment requests are reviewed on a daily basis, so this means that it can take between a few minutes to a day.